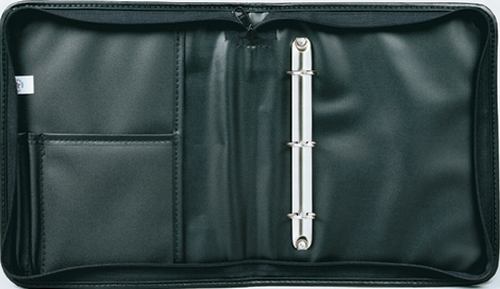 Loose-leaf Form Holder With 3-Ring Binder 717-RVN-BK is a vinyl-made holder that opens with storage and pockets on top, which makes it user-friendly with both right- and left-handed writers. 3-ring binder is spaced to hold all J. J. Keller loose-leaf log pages. The holder also includes 2 pockets for extra logging necessities, and 2 pen holders, and a complete perimeter binding for long life.